As a leader in technology, Japan has seen its position increasingly challenged during the past three decades. Toyoda Akio in front of a Mirai, the first hydrogen-powered consumer vehicle. For many years, Japan was famous for its ability to learn from foreign cultures, importing their technology and improving on it. At the same time, because of its history of political isolationism, it is said to have developed an island mentality that has resulted in both original inventions and headscratching practices and attitudes towards technological innovation. The following is a brief history of Japanese technology during the Heisei period. In the past 30 years, Japanese companies have played a leading role in the automotive market, producing very affordable, reliable and innovative cars. In the process, Japan became the largest car-producing nation in the world in 2000, while, in 2008, Toyota overtook General Motors as the world’s largest car manufacturer. However, in the last few years, new competition from China has reduced the country’s market share. In 1997, Toyota started selling the Prius, the first mass-produced hybrid car in the world, which rapidly assumed cult status thanks to endorsements from environmentally-minded celebrities such as Leonardo DiCaprio and Cameron Diaz. Today, the Prius is sold in over 90 countries, with Japan and the united States being its largest markets, while its hybrid system is installed in around ten million of its cars and licensed to other manufacturers, including Nissan and Ford. At the same time, strong competition from Tesla and other car makers prompted Toyota to push forward towards yet another technological revolution: hydrogen-fuelled cars. The idea had been developed first by Mazda who, at the 1991 Tokyo Motor Show, unveiled the HR-X prototype. 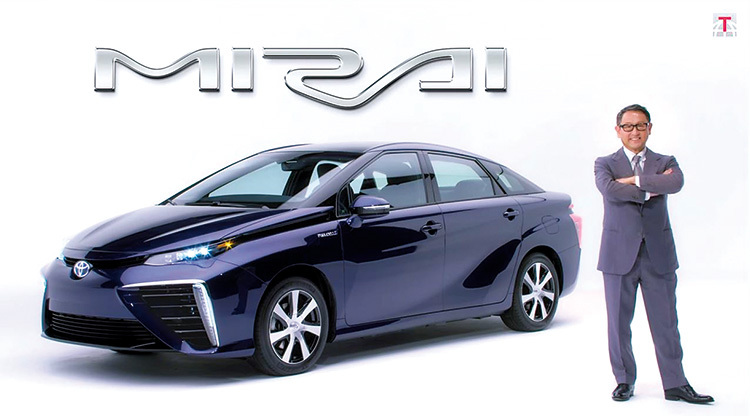 However, Toyota quickly replaced Mazda as the main developer of hydrogen fuel technology, creating the innovative Mirai. Hydrogen is considered the final word in clean fuel because the chemical reaction in a fuel cell produces only water. It’s also quick to refuel, unlike batteries. On the downside, hydrogen is expensive and difficult to store, and cars like the Mirai require the creation of a huge and expensive infrastructure for hydrogen production, transportation and bulk storage. There are still many problems to solve: in February 2017, for instance, Toyota recalled all the 2,800 models it had sold so far due to problems with the voltage output generated by their fuel cell system. The cars were quickly fixed at no cost to the customers. Mobile communication in Japan took off in the early 1990s thanks not to mobile phones but to pagers, or Pokeberu (pocket bells) as they were called in Japan. First launched in 1987 and marketed as a useful business tool, their small size and low price made them increasingly popular among the general public. By 1991, there were about 5.75 million pager subscribers in Japan, and the next 4-5 years saw a boom in sales especially among the young, peaking in 1996 at 10.6 million. Pokeberu usage led to original ways to communicate – using numbers instead of letters to spell words (each digit can be pronounced according to the Japanese syllabic alphabet) – and became the first rudimentary form of social media, way before the advent of Myspace and Facebook. The second phase in the development of mobile communication was the advent of small-sized mobile phones, which became popular thanks to the implementation in 1995 of the Personal Handy-phone System (PHS), a technology that had been developed by NTT in 1989. while PHS phones had a limited range, they worked well in Japan’s dense urban areas and were very cheap. However, PHS were soon replaced by the more advanced keitai (mobile phones) which ushered in keitai culture. In 1997, J-Phone unveiled the Pioneer DP-211Sw, which not only featured a liquid crystal touch screen but could display kanji (a rare thing at the time) and emoji, which were first created by interface designer KURITA Shigetaka. In the same year, NTT Docomo started working on internet connectivity (coincidentally, the world wide web was invented in 1989, when the Heisei period started) and in 1999, was finally able to launch the revolutionary i-mode service, with the “i” standing for internet, information and interactivity. For the first time, keitai users could connect to the internet and send emails and some 200 emoji. By the end of 2000, about half the Japanese population was using keitai. Mobile phones contributed in many ways to changing people’s habits. For instance, people could now read “cell phone novels,” literary works written on keitai via text messaging whose chapters usually don’t exceed 70-100 words. The first mobile phone novel, Deep Love, came out in Japan in 2003 and became so popular that it was also published in book form, selling 2.6 million copies. Some other cultural changes brought about by keitai culture have not been so positive. Cinemas, for example, now regularly show ads telling people to turn off their phones before the show starts. At this point, Japan was still the leading country in mobile communication, and strengthened its position with the creation of the camera phone whose first model, the Sharp J-SH04, came out in 2000. with a 0.11-megapixel camera and the ability to send photos via the so-called “sha-mêru” (photo mail) service, it became wildly popular both in Japan and the west. While Japan’s world supremacy was ended for good when Apple launched the iPhone in 2007, local companies have continued to create new communication devices, the most popular being Line, a smartphone and PC app that allows users to make calls and messages with other Line users, both nationally and internationally. Launched in June 2011 as a response to the 2011 Great East Japan Earthquake, which devastated communication infrastructure, it attracted 45 million users in the first 13 months, becoming in 2013 Japan’s largest social network and most popular messaging app. Currently, it boasts 700 million users in 230 countries around the world, though it is most popular in Japan and other East Asia countries. Today, people use it to call taxis, play games and buy things using cryptocurrency. Line has also reworked the emoji concept into threedimensional e-stickers called “stamps”. Japan has been the pioneer of developments of a number of digital products. For example, in 1986, just before the advent of the Heisei period, Nikon began selling the first digital single-lens reflex (DSLR) camera, the Nikon SVC, introducing the epoch-changing digital camera. In the mid-to-late 1990s, DSLR cameras became popular with consumers, largely replacing film cameras at the turn of the century. In the highly competitive digital television market, the Japanese MuSE standard was, until 1990, the front-runner among the more than 20 different technical concepts developed worldwide. The first public digital high-definition (HDTV) broadcast was of the 1990 FIFA world Cup in June that year. However, the MuSE standard was successfully challenged by foreign competitors, and even in Japan it was later replaced by the ISDB standard (2003), which is also being adopted by South America and the Philippines. Though DVD technology is the result of a collective research effort in Japan, Europe and the uS, such companies as Sony, Panasonic and Toshiba have contributed to its development, releasing the standard DVD (and the first DVD player) in the mid-1990s. In 1994 NEC, together with other foreign companies, began the development of the uSB, which has become a common tool for connecting different types of devices such as keyboards, printers, cameras, scanners, etc. Also, in 1992, NAKAMURA Shûji, AKASAkI Isamu and AMANO Hiroshi invented the first energy-efficient blue light-emitting diodes (LEDs) now commonly used in bulbs. For their energy-saving invention, the three were awarded the 2014 Nobel Prize in Physics. During the Heisei period, the once dominant Japanese electronics industry lost its world supremacy to South korean, Chinese and Taiwanese companies. Portable media players, TVs, computers and semiconductors were some of the categories where Japan lost significant market share. The 2008 economic crisis further contributed to their financial woes, with Sony, Hitachi, Panasonic, Fujitsu, Sharp, NEC and Toshiba reporting losses amounting to $17 billion (£12.8 billion). By 2009, korean giant Samsung was recording profits more than twice the combined profits of nine of Japan’s largest consumer electronics companies. While emoji became wildly popular worldwide and incorporated in ioS and Android phones, making them part of the way people communicate around the world, other Japanese inventions haven’t travelled so well abroad, giving rise to a sort of technological isolationism commonly known as the Galapagos syndrome. A prime example are mobile phones. Japanese companies tried to launch the then-advanced i-mode system in other countries, but mobile phones were quickly replaced overseas by the smartphone. Even today, the local market is still divided into a high-end sector (smartphones) and a mid-to-low-level sector (garakei or Galapagos keitai). Quite surprisingly, even pokeberu are still around. In fact, their service will only come to an end this September. Seen from abroad, the survival in Japan of this outdated technology may seem strange, but after all, this is a place where you can still send telegrams, and more than a few companies continue to prefer fax machines to email.